The much-debated proposal for light rail in Miami Beach is back in the news this week. First, plans for a light rail loop around South Beach were significantly curtailed. Rather than a loop, the proposal now includes one leg from Alton Road along Fifth Street then up Washington Avenue to Miami Beach High School on Dade Boulevard. The reduced route cuts the cost from $360 million to $244 million. One of the key reasons cited for scaling back was public opposition to the plan. In addition to businesses along Alton Road expressing concern about further disruptions following recent road construction there, more than a hundred people raised questions about the proposal at a recent meeting sponsored by Miami Beach United. Yesterday, the group passed a resolution to slow the process down to allow time for Miami-Dade County and the City of Miami to make their own light rail commitments. One of the key elements in the plan is a connector across the MacArthur Causeway from Miami to the Beach (Baylink) that may not happen for quite a while, and concerns about “a train to nowhere” and the compatibility of a future system are high on the list of objections. The group also called for more public input, including a public vote, as well as a better understanding of alternative solutions. 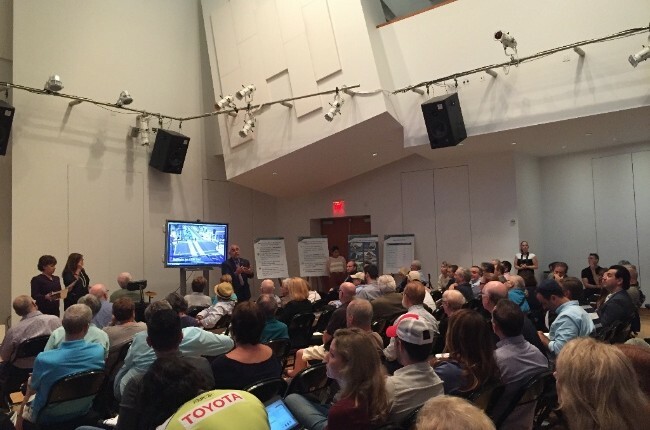 This past summer, the Miami Beach Chamber of Commerce also called on the City to “vet all alternative systems including light rail, street car and rubber rail, in determining the right system that will be fiscally responsible for our community.” Among its concerns, the Chamber noted the costs of adapting a light rail system to be resilient in the face of higher tides and flooding, the reduction of traffic lanes or parking along the route on Washington Ave, and the risk of incompatibility with the Miami transit system. For more information on the alternatives cited by the Chamber, click here. So go do it! Make your voice heard.